One of the best perks about living in City Limitless® is being minutes away from an outdoor adventure paradise. As an avid rock climber, hiker and outdoorsman, I want to share with you my favorite spot for desert adventure: Oak Flat. Every year thousands gather to explore and experience Oak Flat Campground in the Tonto National Forest via hiking, bouldering, and camping. In fact several events and festivals occur here every year including an annual boulder competition where individuals of all ages rock-climb small boulders – with supervision, crash pads, and extreme safety, of course! 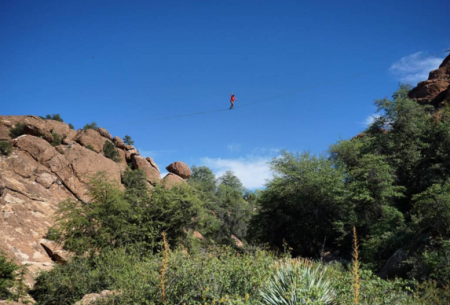 When exploring Oak Flat you might even spot Jared Marvel, a local Phoenix adventurer, set up a highline between two large boulders and walk across, only tethered by his harness and the slack line beneath him. That will make for a memorable vacation photo! Not sure if you’re ready for Oak Flat but still want a taste of adventure? City Limitless® is home to several indoor climbing and bouldering gyms including Focus, an indoor rock climbing gym in Mesa. As a rock climber for the past 7 years, I’ve visited every single climbing gym in Arizona and can confidently say they are the best gym. This is a great “warm –up” adventure for those who have never climbed before. So as you’re planning your winter trip to City Limitless to soak up Arizona’s incredible weather, consider making a pit stop to this beautiful, outdoor, adventure paradise. I’d love to hear about your time in Oak Flat! Find me on Instagram or Twitter and post your own adventure photos in Mesa using #CityLimitless.